Years from now, when Maen Mahfoud is asked exactly where his success as an entrepreneur began, he will likely point to his used silver Volkswagen Passat: his well-worn wagon with the distinctive odor. "You don't even need to get in. You can smell it from here," Mahfoud said standing feet away from the open tailgate. "It smells so bad because every gourmet cuisine you want has spilled in that car," Mahfoud said. To understand how that happened, one must first know a bit about Mahfoud's background. Born in Syria and raised in Kuwait, Mahfoud came to the United States to study medicine at UC Berkeley. Expecting to find a rich country where all were doing well, Mahfoud was surprised by what he encountered on the streets. "There are people in need. There are people in the streets very much similar to where I was in Syria and Kuwait," Mahfoud said. Seeing hungry people, sometimes mere feet from where good food was being thrown away, it seemed silly to Mahfoud not to do something. "It was like, this is fixable," Mahfoud said. "We need to start something." What he started was Re-Plate. 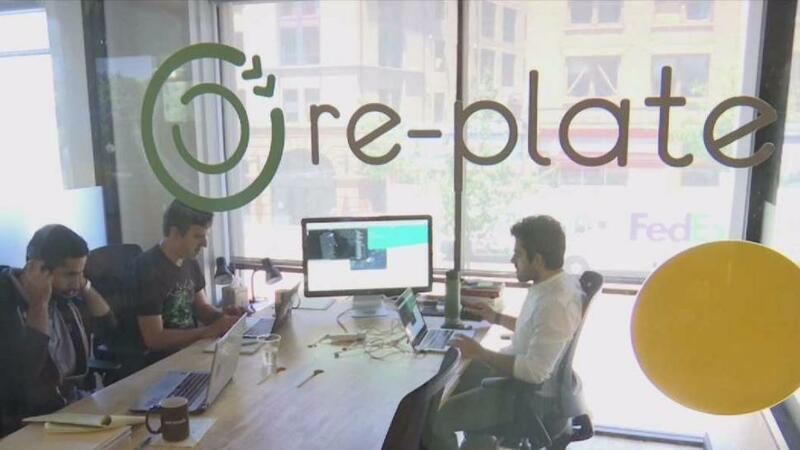 A technology company at its core, Re-Plate has developed an app through which companies (mostly tech ones so far) can alert Re-Plate when they have food leftover from meetings or company provided meals. A driver is dispatched to safely collect the often gourmet meals and deliver them to willing shelters or pantries, or sometimes even provides them directly to those living on the streets. At first, it was just Mahfoud in that Volkswagen but in less than two years Re-Pate has distributed close to one million pounds of food and is continuing to grow. "We now have about 30 drivers in the SF Bay Area. We have about five drivers in New York and we have two in LA," Mahfoud said. Mahfoud says one of the secrets of Re-Plate's success is that they are communicating with technology companies using technology. "We speak their language," Mahfoud says. Companies can not only communicate with Re-Plate through their app, they can monitor a "dashboard" to know exactly how much food waste they have recovered. The other secret, Mahfoud says, is something more ephemeral. While food is what his drivers are carrying, Mafoud believes empathy is what they are delivering. And no one ever wants to see that go to waste.